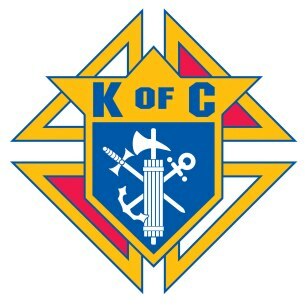 The Knights of Columbus today are Catholic men and their families who are dedicated and caring. They serve our Church, our community, our country and their fellowman, working together for a better tomorrow. If you are a practical Catholic gentleman over the age of 18 and you want to be involved with the good works that our Order promotes, you may wish to join our fellowship. “As a fraternal benefit society, the [Knights of Columbus] Order operates in accordance with the laws relating to such groups. These regulations require a representative form of government comprised of a supreme governing or legislative body and subordinate branches. Members are elected, initiated and admitted into the society according to the provisions of its constitution, laws and rules.” Application for membership is open to practical Catholic men in union with the Holy See, and who are at least 18 years of age. The Order offers a highly rated insurance program. Church Activities: Our council, through its members, supports Our Lady of the Valley parish through contributions of time and money. We provide ushers for mass and we provide counting teams to assist the pastor with the weekly stewardship. Often we are called upon for special duties in and around the church. Our support of our religious, leads us to conduct vocations promotions programs through “Keep Christ in Christmas” and other campaigns. We promote and sponsor Rosary and prayer services. Family and Youth Activities: To strengthen family ties and build community, the council provides several activities. We hold numerous “Family Fun Days” which include our Fishing Tournament, the Halloween Party, and other special events. Contest and competitions are supported and we have had several state-wide winners from our local entries. We co-sponsor (with the Ladies Club) the parish picnic and the parish Christmas party (with a visit from Santa who is personally contacted by council 8393). Charities: Each council supports numerous charities as well as the State Council’s charities. A few of the charities that we have supported are the local chapter of the Alzheimer’s Association, Council on Domestic Violence (Choices), Page One, Page Pregnancy Center, Boy Scout Eagle projects, KOVAR, vocations to the priesthood and Our Lady of the Valley Catholic Church. We also have provided scholarships for local science fairs students and scholarships for our Young Man and our Young Woman of the Year. Our members contribute to the community through thousands of hours of volunteer service. Other projects have included promotion of Special Olympics activities, sponsorship to Camp Easter seals for a local resident and donations toward playground equipment for students with special needs. KOVAR: Knights Of Virginia Aid the Retarded. The Knights of Columbus are the largest contributor by a private organization to this charity. Each council distributes Tootsie Roll™ candy and takes up donations one weekend a year. All of the money collected is then redistributed by the State Council’s KOVAR board, based on applications made to that board by industry or groups that employ or help the retarded citizens of Virginia. Locally, ShenPaCo received over $19,000 in 1999 from the KOVAR fund. Council Activities: Social activity of a council contributes to the enjoyment and edification of the membership. Council 8393 offers such programs as: insurance nights to discuss the benefits of the Knights excellent insurance program with the members, food socials, memorial masses, membership drives, and Knight and Family of the month. Insurance: Beyond the outstanding volunteer and social opportunities, the Knights provide a variety of benefits to members and their families. Member/Spouse accidental death benefits are provided and are based upon the years of continued membership in the Order. Council 8393 meets the first and third Wednesday of the month at 7:30 P.M. in the Common Room of Our Lady of the Valley Church. If you are a member of Our Lady of the Valley in Luray, VA (or a nearby parish), check with an usher at mass. If you are a member of another parish, check with your Pastor; if you are not in the USA, Canada, Mexico, Philippines, Puerto Rico, Guatemala, Panama, Cuba, Guam, the Virgin Islands, or the Dominican Republic, contact the Supreme Council of the Knights of Columbus. Council #8393 was formed under the guidance of Fr. Eugene Neyer (deceased), who was the pastor of Our Lady of the Valley Catholic Church in 1983. The council was named after Fr. Neyer’s late friend and spiritual advisor, Monsignor Paul V. Heller. The council has been recognized for its outstanding efforts by the Va. State Council and by local communities. to provide for the financial security of our members and their families through our fraternal insurance and financial planning program. The emblem consists of a shield mounted upon the Formée cross. The shield is that associated with a medieval knight. The Formée cross is the representation of a traditional artistic design of the cross of Christ through which all graces of redemption were procured for mankind. This then represents the Catholic spirit of the Order. Mounted on the shield are three objects: a fasces (a bundle of rods bound together about an ax with the blade projecting) standing vertically and, crossed behind it, an anchor and a dagger or short sword. The fasces from Roman days, carried before magistrates as an emblem of authority, is symbolic of authority which must exist in any tightly-bonded and efficiently operating organization. The anchor is the mariner’s symbol for Columbus, patron of the Order, while the short sword or dagger was the weapon of the Knight when engaged upon an errand of mercy.